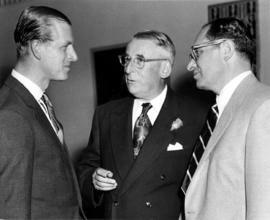 Photograph depicts Jack Diamond, Vancouver Mayor Fred Hume, and His Royal Highness Prince Philip. 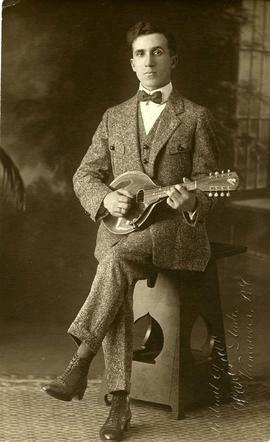 Photograph depicts Baryl Victor posing with a guitar. Photograph depicts Ben Dayson on the deck of a ship leaning on the railing, on route to Seattle for honeymoon. Photograph depicts a group of unidentified men working for the B'nai B'rith Food Bank. Ben Dayson is in back row, third from right. Photograph depicts a portrait of an unknown Nemetz brother. Photograph depicts Nathan Nemetz chatting with Jack Aceman and unidentified man. Photograph depicts Max Drexal (of Drexal Shoes on Granville) standing on a lawn. Photograph depicts Harry Nemetz, Dave Mitchner (cousin), Ben Dayson, Moishe Fine (cousin) seated on a couch taken at the home and Ben Dayson 2772 Spruce Street, Vancouver. Photograph depicts farmers with a horse and cart full of hay at the farm of David Nemetz in Pitt Meadows. Other copies available; refer to PastPerfect for details.